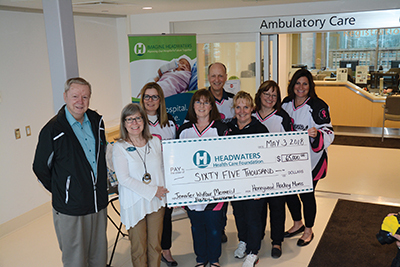 Over the past 11 years, the Jennifer Widbur Memorial Hockey Tournament has produced a huge contribution through their fundraising effort for the Headwaters Health Care Centre and after this year’s tournament, the Honeywood Hockey Moms donated a record amount for their annual gift. The Hockey Moms delivered a cheque for $65,000 to the hospital after the 2018 tournament. That brings the group’s total to $510,000 that has been raised for cancer care at the hospital. The annual tournament takes place at Honeywood arena and is organized and hosted by the Honeywood Hockey Moms, a group of local women who play hockey and organize and run the tournament. This year the group also made a $2,000 donation to Honeywood Minor Hockey as well as a $1,500 contribution to the fund in support of the Humboldt Broncos, the hockey team involved in the tragic accident in Saskatchewan in April. Teams from around the region take part with a few of the teams travelling from outside of the area to play a few games of hockey for a good cause. The Health Care Foundation was pleasantly shocked to see how much this year’s donation amounted to. “We knew they were about $55,000 away from the $500,000 mark. This is the highest amount they’ve ever donated. For us, this put them over half-a-million dollars giving specifically to the oncology department here.” said Nicole Hand, manager of annual giving at the Foundation. About 220 women took part in this year’s on-ice tournament, with more taking other non-playing roles in the event.